Jessica is the newest attorney at Fisher Law LLC. Jessica is a Minnesota native and obtained her undergraduate degree from the University of Connecticut. After graduation, Jessica moved to Kansas City and attended the University of Missouri, Kansas City School of Law. Jessica is licensed to practice law and has completed her guardian ad litem training in the State of Missouri. Prior to working at Fisher Law LLC, Jessica was law clerk to the Honorable John M. Torrence in Kansas City, Missouri. 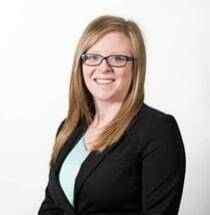 In law school, Jessica was an active participant in the Family Law Clinic and was awarded the John Speca Award, an award given to a top law student with a family law emphasis. Additionally, Jessica was a trial team member and a founding member of the Board of Barristers. Jessica is a member of the Kansas City Metropolitan Bar Association, Missouri Bar Young Lawyers Section, and Association for Women Lawyers. Jessica enjoys being active, trying new restaurants, attending sporting events, and is an avid lover of March Madness!